The present article proposes to think the interface-database dichotomy regarding new media cultural objects in terms of the relationship between story 1 and story 2. With this aim, two different but possibly complementary approaches to this relationship will be considered, namely, Lev Manovich’s and Antonio Caronia’s. According to Manovich ‘Creating a work in new media can be understood as the creation of the interface which allows the access to the database. […] The database becomes the center of the creative process in the computer age. The new media object consists of one or more interfaces to a database of multimedia material’ (Manovich 2001: 200). Therefore the interface becomes an “interactive narrative” that allows the user to traverse the database following her/his own trajectory. For instance, in Mac and Windows operative systems the narrative of the ‘office desk’ is favored, as opposed to the hidden database. Manovich’s hypothesis is that the narrative dimension persists because the dominant order, or logic, of the twentieth century is that of cinema. At this point, it is necessary to add that the logic of cinema is not the only predominant narrative logic. Narratives are pervasive in Western culture; they filter everyday experiences in the same way as new media filters every cultural product today, and they also help to understand the world, to make the unknown more accessible. It is not by chance then that several theorists writing and researching on literature topics have also addressed technological issues, or better, they have used literature and narrative theory as models to understand and try to explain not only what subjects do with technologies –real or imaginary– but also what technologies are doing with subjects, –see, for instance, Brenda Laurel (1991), Janet Murray (1997), Katherine Hayles (1999, 2002, 2005, 2008), and Antonio Caronia (2006, 2010). In the same way in which virtual reality works as a model for human cognition at many different levels, so do narratives; they are, in a strict sense, one of the first virtual realities that humankind created: language, as it were, is one of the first instruments that allowed the creation of other, parallel, worlds. If the predominance of a temporal, linear, chronological paradigm coincided with the rise of history as a discipline in the nineteenth century; currently, the digital logic is bringing back the spatial, simultaneous, non-linear paradigm that had been relegated to “lower” or pop culture –comics, for instance (Manovich 2001). 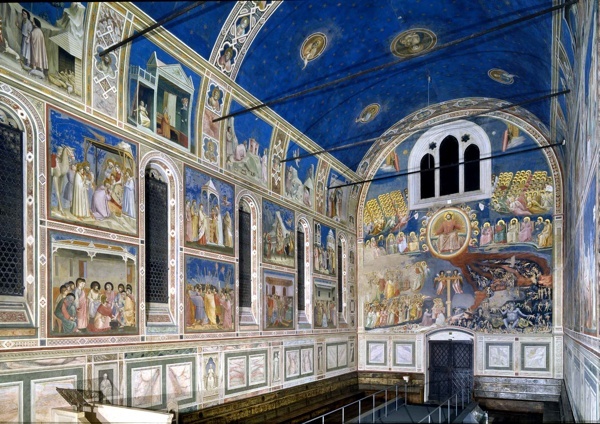 However, the antecedents of this paradigm in Western culture can be traced back to different models, such as certain cycles of frescoes in churches, especially in chapels, and other immersive spatial models which allowed for a non-linear reading and pointed more at an emotional involvement of the viewer through her/his immersion in the space –just like virtual reality. Likewise, and still following Manovich, the dynamics between database and interface can be paralleled to the semiological model of the paradigm and the syntagm, according to which the elements of a system can be related on two dimensions: syntagmatic and paradigmatic. In “traditional” cultural objects, such as narrative and cinema, the elements in the syntagmatic dimension are explicit i.e. it is possible to read all the words in a sentence, while the paradigmatic dimension is implicit, i.e. from all the possible choices among the synonyms of a certain word, only one is chosen. So the syntagmatic dimension has a certain “materiality”, whilst the paradigmatic remains “potential”. However, in new media objects this relationship is inverted: the database is present because all media objects are databases in the last instance; and the syntagmatic dimension is volatile, the narrative of the interface always depends on the user, and it happens to be different, re-created from scratch each time. The story 1, the interface, would be hidden in the interstices of the story 2, the database. The nodal point then is Piglia’s ‘Second thesis’, namely, that ‘the secret story is the key of the form of the tale.’ As it is well known, there are some new media artifacts that especially favor the narrative aspect, this is evident in videogames for example which always have “a plot”; and some others that show the database more openly, as it is the case of online libraries or bookstores, “lists of things” through which one has to browse. However, most websites are a mix of both in which the interface “tells a story” that grants access to the hidden database. In this regard, Antonio Caronia in “The Machine and the Unconscious, or How to Catch the Floating Signifier”(2006) proposes to think of an aesthetic of the database in which there is no opposition, where there should be no “hidden story”, but a coherent intertwining and influence among both. Therefore the idea of having two separate stories, or logics, should be overcome in favor of a relationship with no hidden stories, or to say it in other words, with no separations or hierarchization of ontological levels between interface and database. Reading this dichotomy between interface and database in terms of story 1 and story 2 can hopefully help to develop a complementary model to unveil the ways in which one encodes the other one. And in a second instance it could make it possible to approach a position like the one mentioned by Caronia in which interface and database are intertwined and one gives sense and is coherent to the other. The pertinence of doing this, as developed in a previous article, lies in the fact that interfaces are potentially mediating every cultural artifact one might want to access, not to mention most ways of communicating nowadays: as such, they influence and shape the ways in which one perceives and encodes their world, whether digital or physical. As often happens, art –of any kind– can provide a hint regarding the possible paths to follow for the aforementioned unveiling operation to happen. ‘The short story is built to artificially make to appear something that was hidden. It reproduces the always-renovated search of a unique experience that would allow us to see, under the opaque surface of life, a secret truth. “The instant vision that makes us discover the unknown, not in a far-away unmapped land, but in the very heart of the immediate”, said Rimbaud. – CARONIA, Antonio (2006); “The Machine and the Unconscious, or How to Catch the Floating Signifier” in: L’arte nell’era della producibilità digitale, Ed. A.C., Enrico Livraghi, Simona Pezzano, Mimesis, Milano 2006.